Learn about how to send review requests via email, SMS, and social media. Also, find out how to schedule review requests and view your results. 1. Navigate to the “Reviews” section on the left-hand side of the dashboard. 6. 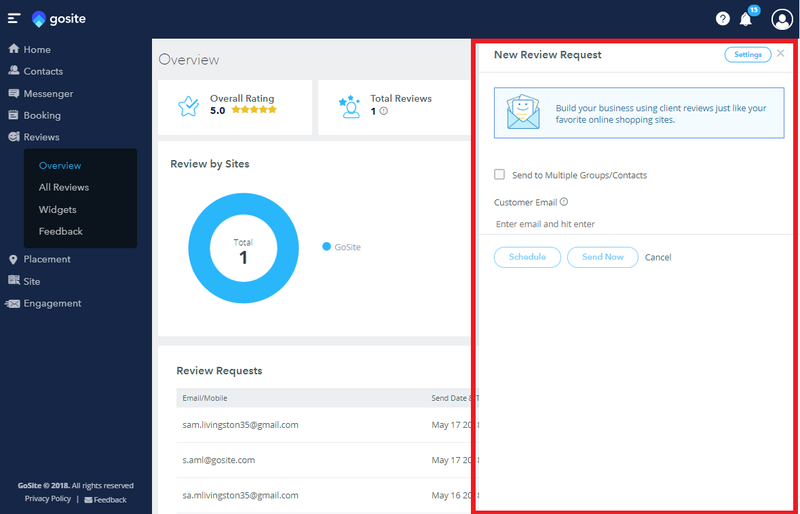 To send the email review request to all of your contacts click the checkbox next to “All Contacts.” If you need help getting your contacts uploaded, please see our article on adding contacts. 7. To send the email review request to contact groups, click the checkbox next to all of the groups you wish to send the request to. 8. Once you have chosen your contact recipients click on either the “Send Now” or “Schedule” button. 9. Choosing “Send Now” will immediately send the request, while choosing “Schedule” will send the requests according to how you have your scheduling set up in your settings. To learn more about how to change your Account Settings click here. 2. Click on the “All Reviews” option under the “Reviews” section. 3. Directly to the left of the “Send Review Request” button is a small paperclip icon. When hovering above this icon you should see “Shareable Link” appear. 4. A screen will pop up which allows you to send a review request via SMS. Here you are able to enter the contact’s phone number and also draft what message you’d like to send. Most importantly, a link is generated in the message which will direct the contact to leave you a review. 5. To finish, just click the “Send SMS” button! 6. Last note! If you would like to copy the link to share it in other formats aside from an SMS message, click on where it says “Click Here” under the “Send SMS” button. 2. At the very top of the page you can see that there are four metrics measured: Overall Rating, Total Review, Requests Sent, and Request Click Rate. 3. Directly below you are able to see a pie chart that displays how many reviews you have gotten from each site and a bar chart that displays your average rating on these sites. These sites can include Yelp, Facebook, Yahoo!, Zillow, etc. 4. In the middle of the page, all review requests that have been sent out are displayed. You will be able to see the date and time the request was sent, if it was sent, and if the contact clicked on the review link. 5. At the very bottom of the page you can see the actual reviews clients have left for you. These are shown by most recent but if you want to see all of your reviews click the “View All” button. 7. This page is reserved for negative reviews. If our system captures any review which is below your desired rating, it will automatically push it to a private feedback form rather than posting it publicly. Use this feedback to your advantage and to improve your business! If you'd like to see a video walk through of how to send out a review, click below!